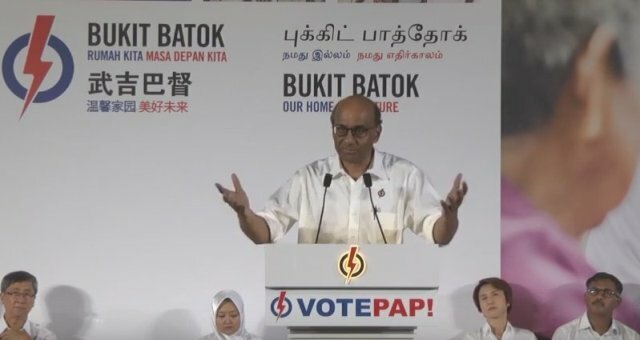 Deputy Prime Minister Tharman Shanmugaratnam was the key speaker in the People’s Action Party’s (PAP) rally last night (5 May) at Bukit Batok. He spoke at length in support of Murali Pillai, PAP’s candidate. Tharman, however was highly critical of the Singapore Democratic Party (SDP) and especially its secretary-general, Dr Chee Soon Juan. Dr Chee is the SDP’s candidate for the Bukit Batok contest. Mr Tharman said that he is not against opposition political parties and thinks that opposition is good for Singapore. (Not sure if the opposition political parties needed his acceptance and approval.) But he said that Singapore Democratic Party’s (SDP) politics are bad for Singapore because they are alarmist and populist. Tharman talks about SDP’s healthcare policy and said that the opposition party promises universal healthcare and free medical care, but don’t talk about the costs involved with their policy. Towards the end of his Speech in saying that he did not want to finish it with soaring rhetoric as it was not his or Murali’s style, Tharman could not avoid taking a cheap shot at SDP (PAP style?). He said that he had borrowed the tele-prompter from SDP. [fvplayer src=”http://youtube.com/watch?v=Kh2n9FE7jQE”]At the rally Tharman said that he is willing to debate with the SDP regarding their policy proposals. But it seems that he does not want to debate with them in Parliament. He also did not say where, when or how the debate can happen.